If you and your significant other have agreed to go to couples therapy together, you want to make sure that you’re getting the absolute most out of your sessions. It doesn’t matter if you and your partner are in a great place with one another or if there are issues that you’re trying to work out, these sessions are ultimately tools to help you become the best team you can be. In today’s blog post, we are going to touch on a few of the ways that you can make sure you are making the most of the time that you have. Let’s dive right in. It can be challenging to walk into a couples therapy session and not focus on your partner. 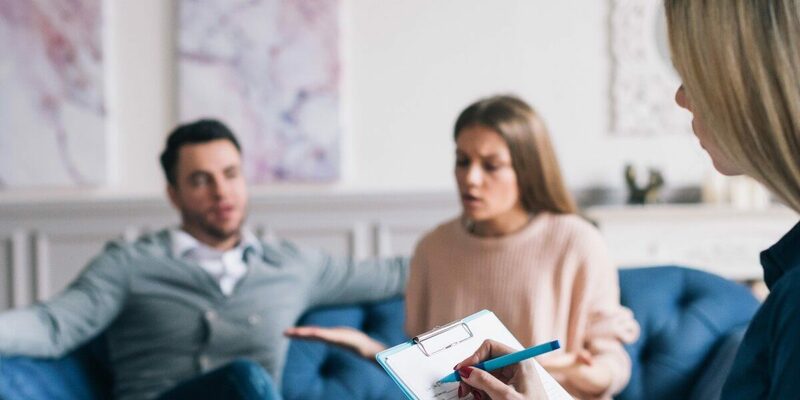 While you may be attending couples counseling as a unit, you want to make sure that you’re still focusing entirely on the ways that you can improve. One of the best ways to do this is by setting goals for yourself, not your partner. Even though there are likely a handful of ways that you’d like your partner to change, do your best to avoid focusing on them. Instead, focus on the ways that you would like to change or improve your bad habits. There’s no doubt about it, therapy sessions can be overwhelming. The first few sessions that you attend can be especially tricky because you don’t yet have a relationship with your counselor. While it may be difficult for you to open up to people that you don’t know, or even just open up about your relationship at all, try your absolute hardest to be vulnerable. That’s not to say that therapy sessions won’t be successful if you aren’t entirely putting yourself out there. You will, however, see a difference when you let down your walls and get vulnerable during a session. We can’t state it enough, couples therapy is not only for the bad times. Even when things are great between you and your significant other, you want to make sure that you’re taking the time to hear them out. When sensitive subjects come up, try your best to avoid jumping to conclusions and give them the benefit of the doubt. Having a successful experience with counseling can only be done when you put in the work. Too many people believe that the only work to be done is the therapy session itself. While it is crucial that you dedicate yourself to the session, that’s definitely not the only place that you’ll be putting in time. Often, counseling sessions will end with suggested activities, reading, journaling, and so much more. If you really want to reap the benefits of working with a therapist, you need to make sure that you’re doing the work and putting in the time. If you’re ready to make the most of your relationship, contact me, Dr. Sunda Friedman, today. I have been dedicated to providing the communities in Boulder and surrounding with the guidance and counseling they seek. If you’re ready to be the best version of yourself, reach out today and schedule your free consultation.